WildZests: Been There & Done That....But We're Going Back For More! Been There & Done That....But We're Going Back For More! Ever since our first trip to Ladakh in 2007, the place keeps pulling me every year and I can never seem to get over it! A lot of people ask me, don't you want to see other places! What's so special in Ladakh that you want to go there each year, haven't you been to most places by now? Well, the answer is yes, I've been to most places and done most of the things that everybody does there and even some which not everyone dares to do. But the place has so much to offer that I'd never get to a state where I get bored of it. For a place to be so good, it can't only be the landscapes, it can't only be the people, it can't only be the weather, it has to be a confluence of a lot of things that makes Ladakh a very unique experience. If there is something that I'd recommend as places to be before you die, this would be at the top! Now, I know that not everyone is as crazy as us (Gozu and me) when it comes to travel. We're not the ones who enjoy the relaxing leisure trips where there's nothing to do but sit on a chair and read books or stay in bed all day. Not that it's a bad way to spend your vacation, but I guess we're just not cut for it. We don't really care for expensive hotels to stay, big variety of food for our meals, or even room service for that matter. All we need to have is some action everyday on our trips, be it adventure, driving, exploring new places, or even shopping at times. Photography is always the hidden agenda for all trips given the fact that I'm so into it now and a dozen of good pictures just makes it feel so rewarding that all expenses are quietly forgotten. This year is special for the both of us as little Pozu will embark with us on her first journey to the Land of the Lamas, Ladakh. We had canceled the trip last year due to various reasons related to work etc. But for this year, we have firmed up our plans to make a road trip with her and the preparations have already begun. It's not going to be easy, but who the hell ever said that we wanted it easy! Over these years, I've shot numerous pictures of the place and I'd say each one is special in some way or the other. So last weekend, I dug out some of the extra special ones and processed them again, but this time in B&W. Whether the picture flaunts the brilliant blue skies or the grey monotones, whether it is at the ever so beautiful Pangong Tso or at Moreh Plains or at Hanle, there is a certain magic in these places that catches your eye. 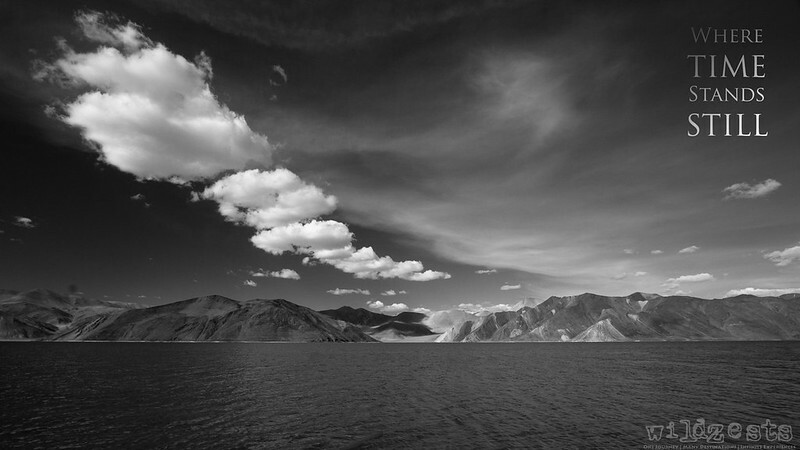 A must visit for everyone who goes to Ladakh is Pangong Tso. The beauty of the lake is typically said to be in the calmness and changing colors of the water through the day, though there are quite a few idiots who go there only to see the shooting location for the film 3 Idiots. The saline water body at 14000ft that gets fresh water from the melting ice each year and yet continues to be lifeless around it is in itself a marvel. Add to that the snow capped mountains that surround it along the boundary and you have the perfect rejuvenating picture in front of you. Nothing really moves apart from the fluffy clouds and the colors in the water, it does feel like time just stops here! Here's one of my favorite shots of the lake from my last bike trip.